Hunter Angler Gardener Cook, winner of this year's James Beard Award for best food blog, is a site I find myself turning to often. What sets Hank Shaw's blog apart from the pack, besides his great writing, is how connected his cooking is to foraging. He writes mostly about food he has hunted/caught/grown/gathered himself, which is pretty remarkable. It's also quite different from my current experience. As an apartment-dwelling urbanite, I don't have the opportunity to obtain my food so directly, at least not on a consistent basis. Like many, I rely on the grocery store and farmers market to supply my raw materials. But as a child, I grew up a family that, although primarily sustained by the grocery store, supplemented that with a fair amount of food from our own efforts. My grandmother's rather large (by city standards) vegetable garden supplied us with freshly grown vegetables, legumes and berries. She also raised chickens, and when I stayed with her, it was my job to collect the eggs. My mother also grew (and still does) vegetables and herbs in her garden. Last year she turned out some pretty peppery arugula and her tomatoes are always amazing. And my father went after the game, mostly elk in the winter and fish in the summer. Being close to the Columbia River and the Pacific Ocean, we had access to all sorts of sea life, including fresh dungeness crab, sturgeon and, naturally, salmon. Shaw's recipes for things like wild bullfrogs and wild bear are unlikely to ever be made in my kitchen; however, his fish recipes are more akin to something I have the tools and available ingredients to make. I've featured several in The Feed, including Salmon with Avocado Salsa and Steelhead with Sorrel Sauce and Salsify. His recent recipe for butter-poached salmon with dill-horseradish cream inspired me to make something similar. As lusciously wonderful as butter-poached salmon sounds, I decided to a lighter route by just broiling my salmon, as I typically do, with a little bit of butter on top. 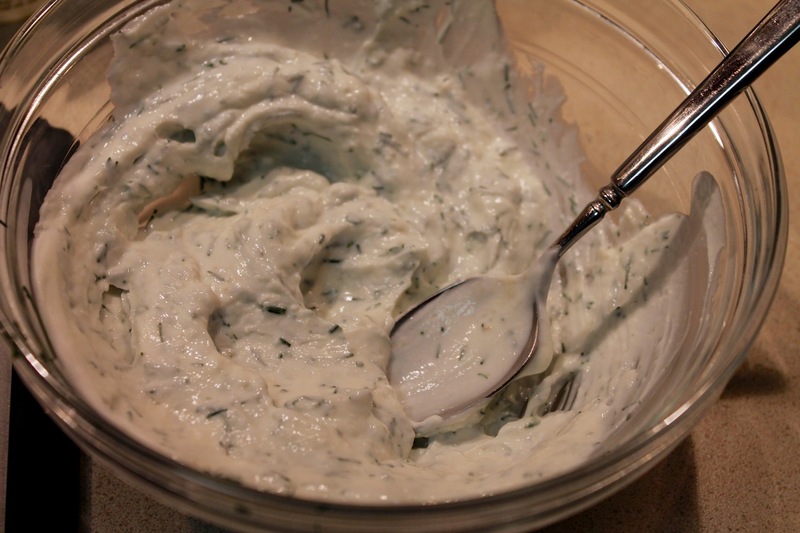 I also used Greek yogurt, instead of sour cream for the sauce, which I tried before with tarragon and lemon and it worked great with the dill and horseradish in this recipe. I mixed the butter with olive oil, which lowers its smoke point to prevent it from burning while the salmon cooks (it will still brown a bit, but browned butter is great). By spreading the butter/oil/garlic mixture on top of the fish with the flesh-side up, it melts into the fish as it starts to cook then pools on the bottom. Then, once it's time to flip the salmon, the fleshy side continues to cook in the garlicky buttery mixture. 1. Preheat oven broiler with rack in highest position (4-5 inches from broiler). 2. Combine olive oil, butter, garlic and salt in small bowl. 3. Place salmon skin-side down on a lightly oiled rimmed baking sheet. (Note: I recommend using a small rimmed baking sheet or, better yet, creating a confined space for the salmon by placing it on a piece of aluminum foil with the ends folded up to make a 1/2-inch rim around it. This contains the oil and butter as the fish cooks, making it less likely to spread out and burn and also more likely to add good flavor to the fish). Spread the garlic mixture evenly on top of the salmon. Place under the broiler and broil for about 5 minutes. Turn the fish over and broil for another 5 minutes until desired doneness is achieved. Remove from oven. 4. 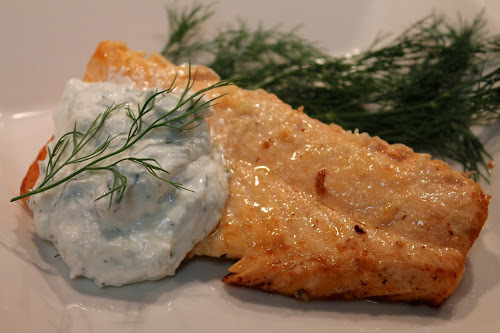 While the salmon cooks, stir together the yogurt, horseradish and dill. If desired, add black pepper. When the salmon is finished, remove and discard the skin, divide the fish into two servings and serve it topped with the yogurt-dill sauce. Enjoyed your intro to this post. I agree it's unlikely we'll ever feast on wild bullfrog or wild bear.